Bri Sandoval. Art Day. Grade 12, Age 18. 2013 Gold Key, Painting. Tom Berger is the Assistant Director of Continuing Education at the Cleveland Institute of Art, and runs the Scholastic Art & Writing Awards’ Cleveland Art and Writing Regions (aka the Cuyahoga County Region). He recently helped us organize our first summer Boys.Write.Now workshop, part of a 5-city series of FREE writing workshops for boys in grades 7-12 where they were able to tell and share their stories, experiment, and express their creativity in a fun and supportive environment. We asked him to share some of his favorite tips for staying creative. Check them out below! We hope they spark some new ideas that can be turned into a Scholastic Art & Writing Awards submission. Learn how to enter today! Deanna Miller. The line began to blur between her fantasy world and her real world. But sometimes, just sometimes, there was an air of symmetry between the two. Grade 12, Age 17. 2012 Gold Key, Digital Art. In a recent blog post, Start.Write.Now: Fantastic Journeys, we featured the 2013 Gold Medal-winning Science Fiction/Fantasy story, The Lions’ Den. After reading and relishing it, we couldn’t help asking ourselves once again: how did she do it? Seeking a satisfactory answer, we went right to the source: 18-year-old author and Texas native Mary Elizabeth Dubois. Check out our Q & A with her below. And flex your fantastic imaginations and fingers, because the 2014 Scholastic Art & Writing Awards launches on Monday, September 16! What inspired you to choose this genre to write Lions’ Den? I am usually inspired to write when I am in the middle of a crowd. The idea for my submitted piece, “The Lions’ Den,” came to me in the middle of a crowded pizza shop in New York City. I don’t need time, space, or comfort to write. All I need is an idea and my iPhone notepad app. Coffee and Earl Grey tea don’t hurt, either. 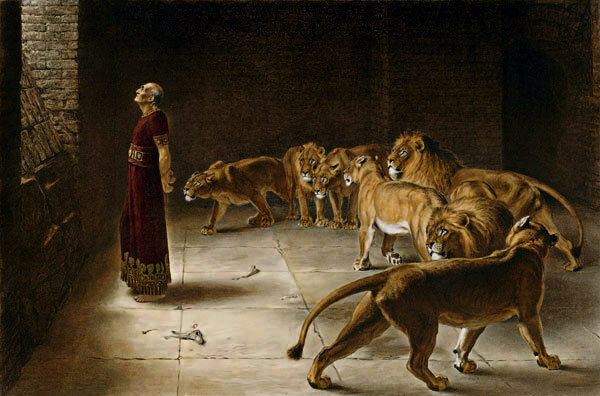 Daniel in the Lion’s Den by Briton Riviere (1840-1920), painted in 1892. Just the Facts: The Scholastic Art & Writing Awards’ Science Fiction/Fantasy Category includes writing that uses supernatural, magical, futuristic, scientific, and technological themes as a key element of the plot. All teens in 7-12 grade are invited to submit works of 600-3,000 words to the 2014 Scholastic Awards beginning September 16. The genre of fantasy allows a writer to travel through time, revisit ancient tales and reset them in the future, give voice to the outlandish and stretch our abilities to imagine and believe in the story we are being told. In “The Lions’ Den,” Mary Elizabeth Dubois (2013 Gold Medalist) soars back to biblical times for inspiration, and uses the apocryphal episode in which Daniel is placed in grave danger because he worships God. See if her re-imagining rings true for you—or at the very least, weaves its own magical web! Walking was such a treacherous thing. She had been walking and walking and walking since she was a small child. Barely breathing, they taught her to walk. Before she learned how to eat or say her name, she was taught to walk. Start.Write.Now: A Video Game Team that Clicks! Glitchbusters and their teacher at the 2013 National Scholastic Art & Writing Awards Ceremony at Carnegie Hall! From left: Ashwin Datta, Justin Mellott, Chitra Datta, Kyle Hiebel, and Andrei Blebea. What makes a video game not just fun, but addictively amazing? We asked Glitchbusters, a team of 4 high school students from Hillsboro, Oregon whose game earned a 2013 Gold Medal in our Video Games Category and a $1,000 AMD Game Changer Award. Almost as impressive as this recent achievement is that fact that they designed it as a team: they’ve been studying and designing games together for 4 years—and they’re still friends! Check out our Q & A with them below. What is Glitchbusters? How did the group come together? We’re Ashwin Datta, Andrei Blebea, Kyle Hiebel and Justin Mellott. Besides being friends and avid gamers ourselves, we have been programming for about 4 years. Our original games were all made in Game Maker while our latest game, Modern Health Care, was made in XNA, which is a programming framework based on C#. What’s your 2013 Award-winning game about?